WHAT COULD BE AL-FARABI “founder of Islamic Neoplatonism” ADDED VALUE? My present essay on Al-Farabi is a compilation of what have been written on his work. In the following you may find some extracts and my view within modelling of a common approach: “Scenario concept”. But did Al-Farabi predict modelling when he confirmed the existence of the “first intellect” as the highest form of knowledge? as present in the acquired intellect of a philosopher, can be represented through imitation to the rest of humanity who could not otherwise understand or attain to it because their intellects are only potential. This imitation is effective in getting this knowledge (or truth, because it is indisputable) across because it is based upon the sensibles of the prophet, which are those things he has experienced during his life and stored in his memory. As such, they can be assumed to be understandable to those around him because they will fall within the general experience of their social context. Furthermore, these imitations (or ‘symbols of the truth,’ as al-Farabi calls them) will be combined by the prophet into an overall system of imitations, called a religion (din). Al-Farabi : A philosopher, logician and musician, he was also a major political scientist. (The Virtuous City) which,far from being a copy or a clone of Plato's Republic, is imbued with the Neoplatonic concept of God. Of course, al-Madina al-fadila has undeniable Platonic elements but its theology, as opposed to its politics, places it outside the mainstream of pure Platonism. A total of ten intellects emanate from the First Being. The First Intellect comprehends God and, in consequence of that comprehension, produces a third being, which is the Second Intellect. of this comprehension is the production of the body and soul of al-sama' al-ula, the First Heaven. First, there is what might be termed discernment or prudence. the source of all intellectual energy and power. The best known Arabic source for al-Farabi's political philosophy is al-Madina al-fadila. At the heart of al-Farabi's political philosophy is the concept of happiness (sa'ada). The virtuous society (al-ijtima' al-fadil) is defined as that in which people cooperate to gain happiness. The impact of al-Farabi's work on Ibn Sina was not limited merely to illuminating Aristotle's Metaphysics. It was with good reason that al-Farabi was designated the 'Second Master' (after Aristotle). The Christian Monophysite Yahya ibn 'Adi studied in Baghdad under al-Farabi and others. Like his master, Yahya was devoted to the study of logic; like his master also, Yahya held that there was a real link between reason, ethics and politics. the science of technical devices (ingenia) (see the tables in Bouyges 1923, 65–69). of logic, and he further distinguishes with al-Fārābī between five kinds of syllogistic reasoning, of which demonstration is the highest. Arnoul remarks that neither Aristotle nor common usage includes Rhetoric and Poetic among the parts of logic (Lafleur 1988, 342). The influence of al-Fārābī's Enumeration of the Sciences extends also to specific areas such as music (Farmer 1934, 31–34). A special case is Michael Scot's Division of philosophy, which adopts substantial material from Gundisalvi, but arranges it according to its own scheme (Burnett 1997). were new to the Latin West (Burnett, forthcoming). ibn Muhammad ibn Tarkhan al-Fârâbî (c. 870-950). while turning to Plato for his political philosophy. Farabi's familiarity with Aristotle is evident in the summary sketch of his writings that he presents in The Philosophy of Aristotle. The soul is defined as “that by which the animate substance—I mean that which admits of life—is realized as substance,” serving the triple function of being a formal, efficient and final cause. Specifically, it is the theoretical intellect that has this status, the practical intellect being subsidiary to it. intellect, its substance being identical with its act. Beyond the individual intellect there lies a universal (though Farabi does not call it such) Active (or Agent) Intellect (al-‘aql al-fa‘âl). This is conceived as the formal principle of the soul, engendering in the potential intellect both the basic axioms of thought and the ability to receive all other intelligible notions (Mahdi, 127). This external intellect is also the ultimate agent and final cause of the individual intellect. It both facilitates the individual intellect's operations and, serving as an example of perfect being, draws it back towards itself through acts of intellection. For Farabi, the individual intellect, even when perfected, can only come close to joining with the substance of the Agent Intellect. This reprises a theme sounded in Aristotle's metaphysics, in which the intellects of the heavenly spheres, desiring to be like the Intellect that is the Prime Mover, imitate it as best they can. For Farabi, a person's ultimate happiness is found in this approximation to the ideal. Perfect State.” He recounts the various faculties of the soul, following the model of Aristotle's De anima, emphasizing the presence of an inclination or propensity (nizâ‘) concomitant with each one. whether it is attractive or repulsive to them. practical intellect, which chooses its course of action accordingly. social and political behavior of the individual (Walzer, 171–173). Farabi distinguishes between what must be the automatic response of animals to the affects created in their senses and imagination, and the conscious and considered response of human beings, assisted by their rational faculty. that is required by the nutritive faculty, senses and imagination (Walzer, 175–187). between the sexes, Farabi asserts. in turn generally excel in the “weaker” qualities of mercy and compassion. The sexes are equal, however, as regards sensation, imagination and intellection. equal in terms of their cognitive faculties and capabilities. his paraphrase of the Republic (Walzer, 401, note 421). In theory, therefore, Farabi would consider women capable of being philosophers (as well as prophets), able to attain the happiness and perfection this brings. this view, in deference undoubtedly to Islamic conventions. here and in greater detail in a separate treatise, On the Intellect. intellect, as Alexander called it, as a disposition in matter to receive intelligible “imprints” (rusûm al-ma‘qûlât) (Walzer, 199). These imprints originate as sensible forms that are conveyed to the imagination and modified by it before being presented to the intellect. This is Aristotle's active intellect, as removed by Alexander of Aphrodisias from the individual soul to a universal separate sphere of being. subject and object of sight (Walzer, 201). common to all men,” in the areas of logic, ethics and science (Walzer, 205). conjoined with it as much as is possible. the intelligible notions of the rational faculty. intelligible ideas directly from the Agent Intellect, converting them to imaginative representations. “things divine” (ashyâ’u ilâhîyah) (Walzer, 221–23). a sensible though immaterial form that then embarks on a conventional return trip to the internal senses (Walzer, 223). contexts in which nominal and verbal forms of “intellect” and “intelligence” are employed. enabling a person to perfect his (or her) knowledge of it. engendered there by the Agent Intellect (Bouyges, 29; Hyman, 219). that Farabi formally discusses in the treatise. It is a separate intellect, totally immaterial and external to the human intellect. our potential intellect to receive them (Bouyges, 24, 29; Hyman, 218, 219). This reception of the intelligible transforms the potential intellect from being a mere disposition to think to the active thinking of the intelligible; a process in which the “intellect in act” (al-‘aql bi’l-fi‘l) becomes its intelligible (Bouyges, 15; Hyman, 216). “acquired intellect” (al-‘aql al-mustafâd), the more that intellect thinks itself in thinking them. cognition desirable, except that Farabi does not think it possible. likenesses (ashbâh) of the pure intelligibles (Bouyges, 29; Hyman, 219). and even an afterlife (al-hayâh al-âkhîrah) of sorts (Bouyges, 31; Hyman, 220). eternal individual soul or intellect is weak (Davidson 1992, 56–57). —and very differently—by his community. Christianity in the Fertile Crescent. preliminaries to the study of Aristotle’s Organon. the focus of much philosophical study. De Interpretatione deal with these subjects. at the center of philosophical practice. Baghdadi intellectual life (cf. Abed). of the homonymous term “intellect” (ʿaql). 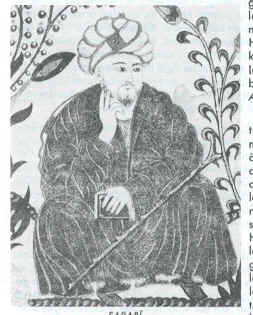 Fārābī created an original and compelling philosophical system. of the People of the Excellent City). which animates and lends coherence to Fārābī’s entire philosophy. sophistic (Sophistici Elenchi), rhetorical (Rhetoric), or poetic (Poetics). five ways (Gutas, 1983, pp. 256-57, 265-66). is made subservient to, and dependent on, ontological noetics. medieval philosophy, Muslim, Jewish and Christian. dramatic shift of focus from motion or change to contingent existence. the second its existence. For instance, Socrates has an essence -- humanity. Al-Farabi's distinction is an extension or generalization of Aristotle's distinction between potentiality and actuality. Aristotle describes every substance as composed of matter and form (or essence). In Aristotle's system, the matter is the aspect of potentiality, and the form is the aspect of actuality. matter at a particular time. each realized by a different immaterial existent. real existence of universals (types, properties, essences). The essence of Socrates is one thing, his existence is another. Both are real, neither is simply the invention or projection of our own minds. All of the ordinary things we encounter are like this: there is always a real distinction between their essence and their existence. Whenever this real distinction occurs, al-Farabi assumes, there must be a cause that explains why this particular essence has been actualized into this particular case of existence. explicit about why this is so. in being at every moment. strange kind of being -- one for which there is no distinction between its essence and its existence. The first cause is the only being for which this is the case. could be possible. But, al-Farabi would urge, so what? comprehensible to our finite intelligence? but this is impossible, since His essence is inseparable from His existence. explanation of how the combination came about. that every limit is obviously contingent, and every contingency is caused. (having an essence that includes a specific limit). Since there is no potentiality in God, God is immutable. would have to differ in essence. intelligibles represented by imitation of what they actually are. fall within the general experience of their social context. information received is not an imitation, but things in actuality. life and death cannot be attained through religion. experience of another who has and can communicate their experience. particular nation), and small (the union of the people within a city). (12) a determination to carry out what he knows is best. that he has taken them from Plato’s Republic. role of Islam in al-Farabi’s thought can be drawn here too. It can be concluded of the results of this study that this great scientists had a philosophical -religious view to education. reading, writing, numeracy, morality play and music. student activities and practice in the reward and punishment methods. individual differences in the students. Foundations of education, objective, programs, methods, teacher, student. the effect of this widespread wave. developments is a sign of educational system flourish. Al-Farabi as founder of Islamic philosophy has a high education thought. login to deepen the foundations of education in this great instructor . investigated as a great instructor. essential for achieving proper philosophy of education. at its dimensions as one dimensional. their importance and the way of attaining them. by investigation, meditation, teaching and learning. deliberative virtue without possessing moral virtue. moral virtues and practical arts are inseparable. as will be discussed next. this life is merely a period of probation. The first is al nafs al ammara, one wont to command evil. passions. Man submits to his carnal desires. created by God to achieve happiness ("The Attainment of Happiness" 43-44). available to the masses who can achieve happiness through this process. Islamic terms in his writings. that does not change from nation to nation or from religion to religion. and without the aid of many other individuals.
" (Mahdi, "Alfarabi's Philosophy of Plato and Aristotle" 23). Alfarabi is consistent with the Quran, which states, "O mankind! and tribes that you may know each other" (Qur'an 49:13). the product is a non-virtuous city full of misery and depravity. there is a fundamental relationship between helping and happiness. well pleasing, so enter among my servants and enter my garden." al nafs al mutma'innah, so that it finds its quietude and its happiness. an imam who is knowledgeable of the first principle and cause of the beings. philosophy and religion are two expressions of a single truth. “How a city can take philosophy in hand without being destroyed. Abu Nasr al-Farabi and Friedrich Nietzsche. because of his thorough going critique of metaphysics and morality. owe a profound debt to classical Greek thought, specifically to Plato. and finally, the troublesome commonalities between them. Greek philosophy, and the only way he can do this is to transform both. “in the measure that innate disposition equips each of them for it”. the principles of being, culminating in the knowledge of God. that the statesman be a philosopher, and vice versa. to bear in the city (AH 60-62). to the multitude and (b) forming the character of the citizenry. them for the benefit of all others according to their capacity. attain happiness though a virtue that is rooted in genuine knowledge. through the popularized medium of images and persuasive speech. the insights of philosophy in a form accessible to the vulgar. neither the images nor the persuasive arguments are intended for himself. “similitude” of the latter [al-milla muhakiatun li al-falsafa ] (AH 55). one true religion, be it Islam or any other. The philosopher, as a good rhetorician, needs to know his audience. demonstratively and intellectually in philosophy. and recalcitrant to participate in the attainment of their own happiness. and the attainment of happiness. Al-Fārābı ̄, in the Kitā b al-H*urūf , is apparently the first person to maintain that existence, in one of its senses, is a second-order concept [ma‘qūlthānı]. As he interprets Metaphysics , ‘‘being’’ [mawjūd] has two meanings, second-order ‘‘being as truth’’ ( including existence as well as propositional truth ), and first-order ‘‘being as divided into the categories.’’ The paronymous form of the Arabic word ‘‘mawjūd’’ suggests that things exist through some existence [wujūd] distinct from their essences: for al-Kindı ̄, God is such a wujūd of all things. Against this, al-Fārābı ̄ argues that existence as divided into the categories is real but identical with the essence of the existing thing, and that existence as truth is extrinsic to the essence but non-real ( being merely the fact that some concept is instantiated ). The H*urūf tries to reconstruct the logical syntax of syncategorematic or transcendental concepts such as being, which are often expressed in misleading grammatical forms. Al-Fārābı ̄ thinks that Greek more appropriately expressed many such concepts, including being, by particles rather than nouns or verbs; he takes Metaphysics to be discussing the meanings of such particles ( comparable to the logical constants of an ideal language ), and he takes these concepts to demarcate the domain of metaphysics. This explains how al-Fārābı̄’s title can mean both ‘‘Book of Particles’’ and ‘‘Aristotle’s Metaphysics. Alfarabi, ‘Political Regime,’ trans. Najjar, in Lerner and Mahdi (with Fortin), eds., Medieval Political Philosophy, (1963), 31-57 at 32. Al-Farabi, Mabadi’, trans. Walzer, (1985), 247-249. Walzer, Commentary to Mabadi’, in al-Farabi, Mabadi’, trans. Walzer, (1985), 331-503, at 445. 26. In spite of al-Farabi’s emphasis on justified war in this passage, he makes no mention of jihad (“struggle” in the lesser sense, which involves an active armed conflict with evil), instead settling upon the more neutral term harb, which refers to war in general. Cf. al-Farabi’s Selected Aphorisms 58 and 67, where he does use the language of jihad. 27. For a thorough-going discussion of the question of just war in al-Farabi, see Charles Butterworth, “Al-Farabi’s Statecraft: War and the Well-Ordered Regime,” 79-100. The reception of the rational sciences, scientific practice, discourse and methodology into Arabic Islamic society proceeded in several stages of exchange with the transmitters of Iranian, Christian-Aramaic and Byzan- tine-Greek learning. Translation and the acquisition of knowledge from the Hellenistic heritage went hand in hand with a continuous refinement of the methods of linguistic transposition and the creation of a standard- ized technical language in Arabic: terminology, rhetoric, and the genres of instruction. Demonstration more geometrico, first introduced by the para- digmatic sciences-mathematics, astronomy, mechanics-and adopted by philosophers embracing the cosmology of Neoplatonism, was comple- mented and superseded by the methods of syllogistic demonstration. Faced with the establishment of philosophy as a demonstrative science, which claimed absolute and universal knowledge, even the hermeneuti- cal disciplines of grammar, theology and law, which depended upon ana- logical reasoning from the Scripture, took up logical definitions and the mode of deduction. The Islamic philosophy instituted by al-Fārābī and Ibn Sīnā (Avicenna), answering questions of Muslim theology, resulted in the integration and unification of scientific and philosophical discourse, and after a process of competition and dispute led to the adoption of the language of demonstration by the scholasticism of the later schools of law. Le style de Farabi est un style ésotérique, ou qui emprunte des motifs ésotériques (conformément à des traditions numérologiques qui sont répandues partout). Il est également à l'origine d'une tradition d'angéologie développé par des Perses et des Juifs vers le Xe siècle, qui a été ré-interprétée par Pierre Lévy dans sa tentative de penser l'intelligence collective dans le cadre d'Internet et des NTIC. Al-Fârâbi est une figure centrale de la philosophie médiévale, puisqu’il influencera l’Islam oriental , l’Islam occidental , les Juifs (Maïmonide) et les Chrétiens. Né dans la région de Fârâd dans le Turkestan, il propose pour la doctrine de la connaissance une « harmonisation » de Platon et d’Aristote, et pour la cosmologie une adaptation d’Aristote à Plotin et sa théorie de l’émanation. Dans son ouvrage phare, Pierre Lévy explique : « Premièrement, Al-Fârâbî et Ibn Sina ont placé au coeur de leur anthropologie l’idée d’une intelligence unique et séparée, la même pour l’ensemble du genre humain, que l’on peut donc considérer, avant la lettre, comme un intellect commun ou collectif. Ce "conscient collectif" a été nommé l’intellect agent par ces mystiques aristotéliciens [...] ». De la doctrine de l’émanation au "conscient collectif"
La doctrine de l’émanation sous-entend une émanation divine, une "action par laquelle Dieu produirait l’univers des esprits et des corps, comme par un écoulement nécessaire de sa nature" (Foulq.-St-Jean, 1962). En quoi ces théories philosophiques médiévales peuvent-elles nous aider à penser l’intellectuel collectif à venir ? - Ainsi le monde angélique devient : « la région des mondes virtuels par lesquels des êtres humains se constituent en intellectuels collectifs ». 2ème siècle. Marc Aurèle (Père de la logique comme stoïcien) "Le propre de l'homme c'est d'aimer"
4ème siècle: Ephrem le Syrien : "Le sage ne hait personne"